Sarah Palin's Katie Couric interview continues to draw controversy over two years after it aired. Katie Couric isn't exactly who you would call a Sarah Palin fan ... and the trainwreck of an interview in 2008 goes to show that. On Sean Hannity, Sarah Palin had a very interesting hour long discussion about a variety of things, including her views on the press. When asked if she would ever have another interview with Katie Couric, Palin in a roundabout way said no. However, the creator of this year's "word of the year" didn't simply utter a two letter word - that would be too easy. She went on to indicate that she has a communications degree, and understands the who, what, where, when, why, and how of journalism -and will have interviews with journalists who understand that basic American freedom. She won't, however, waste her time with journalists who have strong biases against her, and will use whatever she says to create controversy. Of course, some say that Sarah Palin is being overly sensitive. the so-called "gotcha" moment is when Katie Couric asked which publications Sarah Palin reads to stay informed. Palin said "all of them" but Couric wanted specifics. Honestly, if someone asked me what I read, I'd draw a blank too. However, I'm not grooming myself to be the next governor, vice president, or president. Arguably, Fox News has had some aggressive interviews with Obama and other Democratic personalities. Should Sarah Palin talk to Katie Couric again? 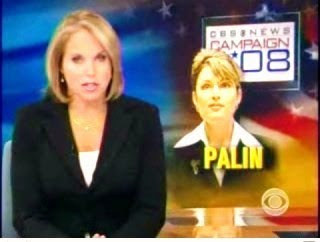 The question should be - would Katie Couric want to do an interview with Palin?